For decades, scientists have theorized that beyond the edge of the Solar System, at a distance of up to 50,000 AU (0.79 ly) from the Sun, there lies a massive cloud of icy planetesimals known as the Oort Cloud. Named in honor of Dutch astronomer Jan Oort, this cloud is believed to be where long-term comets originate from. However, to date, no direct evidence has been provided to confirm the Oort Cloud’s existence. This is due to the fact that the Oort Cloud is very difficult to observe, being rather far from the Sun and dispersed over a very large region of space. However, in a recent study, a team of astrophysicists from the University of Pennsylvania proposed a radical idea. Using maps of the Cosmic Microwave Background (CMB) created by the Planck mission and other telescopes, they believe that Oort Clouds around other stars can be detected. The study – “Probing Oort clouds around Milky Way stars with CMB surveys“, which recently appeared online – was led by Eric J Baxter, a postdoctoral researcher from the Department of Physics and Astronomy at the University of Pennsylvania. He was joined by Pennsylvania professors Cullen H. Blake and Bhuvnesh Jain (Baxter’s primary mentor). 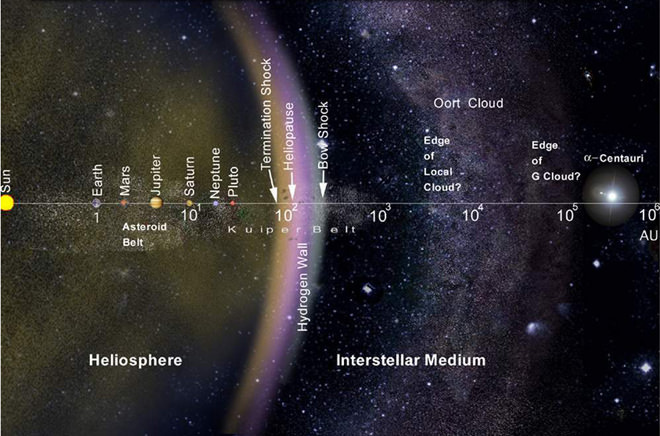 To recap, the Oort Cloud is a hypothetical region of space that is thought to extend from between 2,000 and 5,000 AU (0.03 and 0.08 ly) to as far as 50,000 AU (0.79 ly) from the Sun – though some estimates indicate it could reach as far as 100,000 to 200,000 AU (1.58 and 3.16 ly). Like the Kuiper Belt and the Scattered Disc, the Oort Cloud is a reservoir of trans-Neptunian objects, though it is over a thousands times more distant from our Sun as these other two. This cloud is believed to have originated from a population of small, icy bodies within 50 AU of the Sun that were present when the Solar System was still young. Over time, it is theorized that orbital perturbations caused by the giant planets caused those objects that had highly-stable orbits to form the Kuiper Belt along the ecliptic plane, while those that had more eccentric and distant orbits formed the Oort Cloud. As Baxter and his colleagues indicated in their study, detecting EXOCs is difficult, largely for the same reasons for why there is no direct evidence for the Solar System’s own Oort Cloud. For one, there is not a lot of material in the cloud, with estimates ranging from a few to twenty times the mass of the Earth. Second, these objects are very far away from our Sun, which means they do not reflect much light or have strong thermal emissions. This is a rather revolutionary idea, as the detection of EXOCs was not part of the intended purpose of the Planck mission. By mapping the CMB, which is “relic radiation” left over from the Big Bang, astronomers have sought to learn more about how the Universe has evolved since the the early Universe – circa. 378,000 years after the Big Bang. However, their study does build on previous work led by Alan Stern (the principal investigator of the New Horizons mission). In 1991, along with John Stocke (of the University of Colorado, Boulder) and Paul Weissmann (from NASA’s Jet Propulsion Laboratory), Stern conducted a study titled “An IRAS search for extra-solar Oort clouds“. In this study, they suggested using data from the Infrared Astronomical Satellite (IRAS) for the purpose of searching for EXOCs. However, whereas this study focused on certain wavelengths and 17 star systems, Baxter and his team relied on data for tens of thousands of systems and at a wider range of wavelengths. Other current and future telescopes which Baxter and his team believe could be useful in this respect include the South Pole Telescope, located at the Amundsen–Scott South Pole Station in Antarctica; the Atacama Cosmology Telescope and the Simons Observatory in Chile; the Balloon-borne Large Aperture Submillimeter Telescope (BLAST) in Antarctica; the Green Bank Telescope in West Virgina, and others. In addition, Baxter and his team also detected a hint of a signal around some of the stars that they considered in their study – specifically in the Vega and Formalhaut systems. Using this data, they were able to place constraints on the possible existence of EXOCs at a distance of 10,000 to 100,000 AUs from these stars, which roughly coincides with the distance between our Sun and the Oort Cloud. As our knowledge of the Universe expands, scientists become increasingly interested in what our Solar System has in common with other star systems. This, in turn, helps us to learn more about the formation and evolution of our own system. It also provides possible hints as to how the Universe changed over time, and maybe even where life could be found someday. Newer PostHealth Check: why do I get a headache when I haven’t had my coffee? Older PostResearch Check: can sleeping too much lead to an early death?